Midnight Mass is a Christmas Eve liturgical tradition in the Roman Catholic Church, Anglican Communion, and the Lutheran Churches. The Mass or Eucharist is the central act of worship in the Catholic Church, which describes it as "the source and summit of the Christian life". 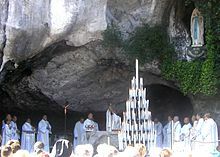 Many of the other sacraments are celebrated in the framework of the Mass. The term "Mass" is generally used only of Latin Church celebrations, while the Eastern Orthodox Church, Oriental Orthodox Church, and the various Eastern Catholic Churches use terms such as "Divine Liturgy", "Holy Qurbana", and "Badarak",in accordance with each one's tradition. 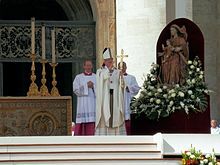 The term "Mass" is derived from the Late Latin word missa (dismissal), a word used in the concluding formula of Mass in Latin: "Ite, missa est" ("Go; it is the dismissal"). "In antiquity, missa simply meant 'dismissal'. In Christian usage, however, it gradually took on a deeper meaning. The word 'dismissal' has come to imply a 'mission'. These few words succinctly express the missionary nature of the Church"
This prophecy of Isaiah never ceases to touch us, especially when we hear it proclaimed in the liturgy of Christmas night. This is not simply an emotional or sentimental matter. It moves us because it states the deep reality of what we are: a people who walk, and all around us – and within us as well – there is darkness and light.... - Pope Francis. There are four liturgies of Christmas: the Christmas vigil, the mass at midnight, the mass at dawn, and the mass during the day. As a result, people will be attending different masses and will not necessarily be experiencing the same readings. Mary Birmingham in: Word and Worship Workbook for Year C: For Ministry in Initiation, Preaching, Religious Education, and Formation, Paulist Press, 1 January 1997, p.72. The liturgies of Christmas are presented in Vigil Mass, Mass at Midnight, Mass at Dawn, Mass During the Day...However, all of the readings shed light on the fullness of Christmas and help to unfold the meaning of the Incarnation. The leigtmotif is even more prominent in the liturgy for the mass at dawn than it is at the midnight mass. The responsorial psalm, the entrance antiphon, and the opening prayer speak of the light that will shine this day on us and on our actions. This prophecy of Isaiah never ceases to touch us, especially when we hear it proclaimed in the liturgy of Christmas night. This is not simply an emotional or sentimental matter. It moves us because it states the deep reality of what we are: a people who walk, and all around us – and within us as well – there is darkness and light. In this night, as the spirit of darkness enfolds the world, there takes place a new the event which always amazes and surprises us: the people who walk see a great light. A light which makes us reflect on this mystery: the mystery of walking and seeing. Pope Francis in: Full text of Pope Francis’s homily at Christmas night Mass at St Peter’s, Catholic Herald. Pope Francis in: :Full text of Pope Francis’s homily at Christmas night Mass at St Peter’s". It is the encounter Jesus. God has always sought out his people, led them, looked after them and promised to be always be close to them. The Book of Deuteronomy says that God walks with us; he takes us by the hand like a father does with his child. This is a beautiful thing. Christmas is God’s meeting with his people. It is also a consolation, a mystery of consolation. Many times after the midnight mass I have spent an hour or so alone in the chapel before celebrating the dawn mass. I experienced a profound feeling of consolation and peace. I remember one night of prayer after a mass in the Astalli residence for refugees in Rome, it was Christmas 1974 I think. For me Christmas has always been about this; contemplating the visit of God to his people. Pope Francis in: Brantly Millegan The 9 Most Important Quotes from Pope Francis’ Clarifying Interview on ‘Evangelii Gaudium’,aleteia.org. Midnight Mass was usually what was then designated a solemn High Mass, meaning there was a lot of singing and incense and it lasted well into the early morning hours. By the time midnight Mass was over, y'ats were hungry again. Earl J. Higgins in: The Joy of Y'at Catholicism, Pelican Publishing, p. 109. For the nineteenth-century French-Creole Catholics, forerunners of today's y'at Catholics, midnight Mass and eating were always a family event, with big, extended families taking part. The early morning feast following midnight Mass came to be called reveilion which derived from the French word reveiller, meaning to wake up. Earl J. Higgins in: "The Joy of Y'at Catholicism", p. 109. The line of open-air booths starting at the church, extended, as far as the hostelry of the Thenardiers. These booths were all illuminated, because the citizens would soon pass on their way to the midnight mass, with candles burning in paper funnels, which, as the schoolmaster, then seated at the table at the Thenardiers' observed, produced "a magical effect." In compensation, not a star was visible in the sky. Victor Hugo in: Les Misérables/Volume 2/Book Third/Chapter 4, Wikisource. The most popular Christmas Mass for Roman Catholics is the Midnight Mass, a tradition that began in the early 400s. Midnight mass is traditionally held at midnight, as Christmas Eve becomes Christmas Day, because it believed that Jesus was born at midnight. In today’s churches, both Catholic and Protestant, services may be held at midnight or earlier, incorporating carols and the Nativity. Yvonne Jeffrey in: The Everything Family Christmas Book: Stories, Songs, Recipes, Crafts, Traditions, and More, Adams Media, 17 September 2008, p. 35. In Spanish and Latin countries, Midnight Mass is referred to as the Mass of the Rooster, after the legend that says the only time a rooster ever crowed at midnight was at the moment of Christ’s birth.. The Polish Midnight Mass is called Mass Pasternak (Mass of the Shepherds), in commemoration of the shepherds present in accounts of the first Christmas. Yvonne Jeffrey in: :The Everything Family Christmas Book: Stories, Songs, Recipes, Crafts, Traditions, and More", p. 35. Mass (Midnight) is that Mass which is said at midnight. 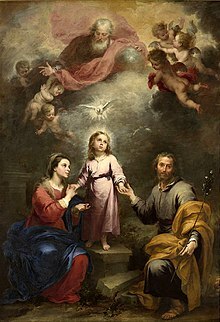 At Christmas three masses are said; the first In nocte in honour of the eternal generation of our Divine Lord; the second, In aurora, in honour of His birth in time, of the Blessed Virgin Mary, His mother; and the third, In die Nativitatis Domini, in remembrance of His birth in our hearts by grace. A Midnight Mass is usually a High mass, though it may be a Solemn Mass, or a Missa cantata. Sleep in heavenly peace. - Joseph Mohr, Franz Gruber. Easter celebrations participate in spring's theme of fertility and rebirth. In the midnight mass, the Pope wears a white robe and lights a large white candle of the ”new-fire” to symbolize the hope and new light of the resurrected Christ. Dennis L. Merritt in" Land, Seasons, Weather, Insect, Fisher King Press, 1 March 2013, p. 53. Joseph Mohr, Franz Gruber in: Dinda L. Gorlée and translated by John F. Young Song and Significance: Virtues and Vices of Vocal Translation, Rodopi, 1 January 2005, p. 80, 83. In 1818, during the annual Christmas Midnight Mass at the St. Nicholas Church at Oberndorf, Austria, the song known as “Silent Night! Holy Night!” (or just “Silent Night”) was performed in public for the first time. The Christmas midnight mass was the climax of a memorable celebration in a beautifully painted, carved and decorated church. Even the highest ceiling revealed heavenly designs of angels and saints and biblical personages. Agnes Sutherland in: Northerners Say: "Thanks, Sisters", Les Oeuvres de Mère d'Youville, 1 January 1996, p. 158. This page was last edited on 13 December 2016, at 07:22.